A struggling writer has an obsessive interest in wine. The Londonist team couldn't possibly identify with that. When the movie Sideways came out in 2004, the lead character's preference for pinot noir over Mmrlot actually shifted buying habits in the US and UK. Morons. Don't they know the best red to come out of California is zinfandel? The things that stick in the memory from the classic 'buddy' road picture are the endless driving round the Santa Ynez valley, and Sandra Oh whacking Thomas Haden Church upside the head with her motorcycle helmet when she finds out he's not actually single. So we need a car, a bike, a couple of vineyards and some sunshine — how does the St James's production deliver? Big on imagination, short on props — a few folding wooden screens serve for all the locations, with two differently-shaped bar counters doubling for all the wineries' tasting rooms. A back projection might have set the mood, but maybe without it you're meant to focus on the dialogue between the tourists and the women they're pursuing. We did try. Jack wants to get into Terra's pants, Miles wants to get into Maya's wine. Both talk about their separate objectives an awful lot. Apart from one being a swallower and the other a spitter, Daniel Weyman and Simon Harrison are not sufficiently differentiated either physically or vocally to make a successful 'odd couple' but Ellie Piercy and Beth Cordingly come across as interesting intelligent women who ought to be too wily to fall for these soaks. The phrase Harrison's character uses for his ejaculatory ambitions is that he wants to 'get his nut'. Apparently it's a Super Mario reference, but it feels misogynistic and crass even for an overgrown frat boy. They bicker. They fight. You know that thing when someone gets so out of it at a wine tasting he actually drinks the spittoon? That's the dramatic high point. It raises a laugh, as do several of the lines, but it turns out that watching people drink expensive wine is sometimes not much more fun than watching expensive paint dry. Oh, and the title. It's a reference to the off-beam shift of their mid-life crises but also to the rivers of the Central Coast of California which are the only ones in the US that go from east to west, instead of 'up and down' the map. That makes the Santa Ynez valley ideal for pinot noir as the sun’s on the grapes all day long and moist evening air from the sea gives them a cool restful night. You're welcome. 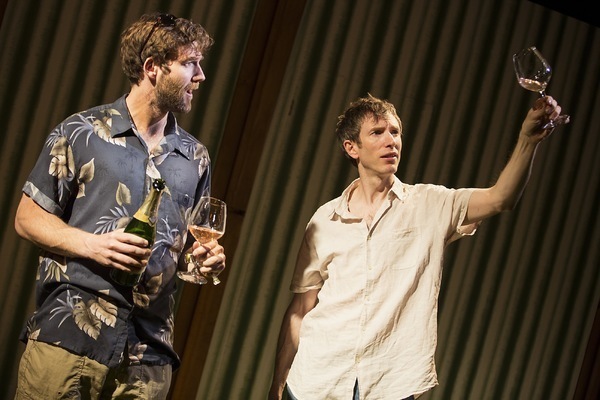 Sideways continues at the St James's Theatre until 9 July. Tickets £15-£39.50 from the theatre website. On selected evenings there are hosted wine tastings for £65 including top price ticket. We saw this play on a complimentary ticket.